The results of research conducted by professors at UC Santa Barbara and colleagues mark the beginning of a new paradigm for our understanding of the history of Earth's great global ice sheets. The research shows that, contrary to the popularly held scientific view, an ice sheet on West Antarctica existed 20 million years earlier than previously thought. The findings indicate that ice sheets first grew on the West Antarctic subcontinent at the start of a global transition from warm greenhouse conditions to a cool icehouse climate 34 million years ago. Previous computer simulations were unable to produce the amount of ice that geological records suggest existed at that time because neighboring East Antarctica alone could not support it. The findings were published today in Geophysical Research Letters, a journal of the American Geophysical Union. 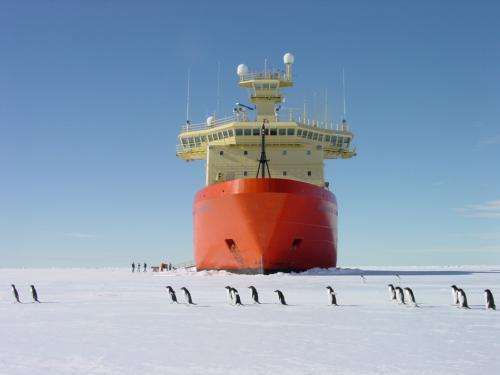 Given that more ice grew than could be hosted only on East Antarctica, some researchers proposed that the missing ice formed in the northern hemisphere, many millions of years before the documented ice growth in that hemisphere, which started about 3 million years ago. But the new research shows it is not necessary to have ice hosted in the northern polar regions at the start of greenhouse-icehouse transition. Earlier research published in 2009 and 2012 by the same team showed that West Antarctica bedrock was much higher in elevation at the time of the global climate transition than it is today, with much of its land above sea level. The belief that West Antarctic elevations had always been low lying (as they are today) led researchers to ignore it in past studies. The new research presents compelling evidence that this higher land mass enabled a large ice sheet to be hosted earlier than previously realized, despite a warmer ocean in the past. "Our new model identifies West Antarctica as the site needed for the accumulation of the extra ice on Earth at that time," said lead author Douglas S. Wilson, a research geophysicist in UCSB's Department of Earth Science and Marine Science Institute. "We find that the West Antarctic Ice Sheet first appeared earlier than the previously accepted timing of its initiation sometime in the Miocene, about 14 million years ago. In fact, our model shows it appeared at the same time as the massive East Antarctic Ice Sheet some 20 million years earlier." Wilson and his team used a sophisticated numerical ice sheet model to support this view. Using their new bedrock elevation map for the Antarctic continent, the researchers created a computer simulation of the initiation of the Antarctic ice sheets. Unlike previous computer simulations of Antarctic glaciation, this research found the nascent Antarctic ice sheet included substantial ice on the subcontinent of West Antarctica. The modern West Antarctic Ice Sheet contains about 10 percent of the total ice on Antarctica and is similar in scale to the Greenland Ice Sheet. West Antarctica and Greenland are both major players in scenarios of sea level rise due to global warming because of the sensitivity of the ice sheets on these subcontinents. Recent scientific estimates conclude that global sea level would rise an average of 11 feet should the West Antarctic Ice Sheet melt. This amount would add to sea level rise from the melting of the Greenland ice sheet (about 24 feet). The UCSB researchers computed a range of ice sheets that consider the uncertainty in the topographic reconstructions, all of which show ice growth on East and West Antarctica 34 million years ago. A surprising result is that the total volume of ice on East and West Antarctica at that time could be more than 1.4 times greater than previously realized and was likely larger than the ice sheet on Antarctica today. "We feel it is important for the public to know that the origins of the West Antarctic Ice Sheet are under increased scrutiny and that scientists are paying close attention to its role in Earth's climate now and in the past," concluded co-author Bruce Luyendyk, UCSB professor emeritus in the Department of Earth Science and research professor at the campus's Earth Research Institute.